Our Ford dealership near San Francisco has taken delivery of the new 2016 Ford Escape. 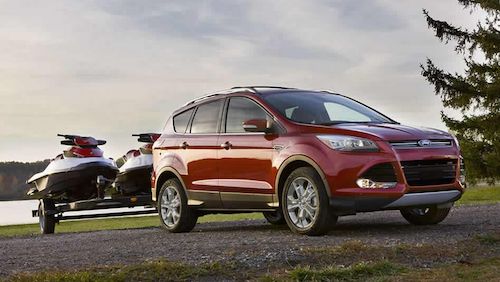 The Escape is a powerful vehicle loaded with convenient technology. It offers ample room for five adults and is built with eco-conscious engineering. Eco-conscious materials, including material from recycled jeans, sweaters and T-shirts has been used for sound absorption throughout the new Ford Escape. Even the carpet is comprised of polyester fibers made from recycled plastic bottles. To further enhance the eco-friendly interior environment, the Escape is offered with an available panoramic vista roof with tilting or removable top panel. This feature allows abundant sunlight or moonlight and fresh air to pour in from above. Powered by a 168-horsepower 2.5L Duratec engine or a choice of two available EcoBoost engines, the Escape is strong enough to tow loads up to 3,500 lbs. Its 6-speed SelectShift automatic transmission, Intelligent Four Wheel Drive system and Curve Control feature allow the driver to thoroughly conquer the road ahead. The newly designed Ford Escape cabin has been enhanced for maximum passenger comfort and cargo-carrying space. Available voice-activated SYNC technology for hands-free calling, music search or control as well as an emergency 911 assist feature, are just a few of the easy controls that keep the driver safely connected. Other convenience features include the Active Park Assist and a hands-free, foot-activated liftgate. The new Ford Escape is available as three models the Escape S, SE, and Titanium. It has a modest starting MSRP around $22,900. We currently have a wide selection of 2016 Ford Escapes for sale near San Francisco, CA to choose from, so why not stop by and take a test drive today?